Review by AllTheBestFights.com: 2017-06-25, close fight with some nice exchanges: BJ Penn vs Dennis Siver gets three stars. The black belt in Brazilian jiu-jitsu, former Ufc Lw and Ww champion BJ Penn entered this fight with a professional record of 16-11-2 (81% finishing rate) while his opponent, the black belt in tae-kwon-do Dennis Siver, has a mma record of 22-11-0 (64% finishing rate). Both fighters lost their last bout: Penn was defeated by Yair Rodriguez in 2017 (=Rodriguez vs Penn) while Siver lost to Tatsuya Kawajiri in 2015 (=Siver vs Kawajiri). 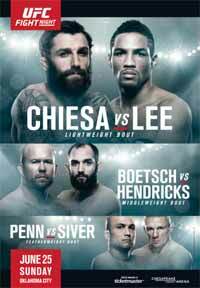 Dennis Siver vs BJ Penn is on the undercard of Michael Chiesa vs Kevin Lee – UFC Fight Night 112. Watch the video and rate this fight! Review by AllTheBestFights.com: 2015-01-18, nice exchanges between Conor McGregor and Dennis Siver: it gets three stars (UFC Performance of the Night). Conor McGregor entered this fight with a professional mma record of 16-2-0 (94% finishing rate) and he is ranked as the No.7 featherweight in the world (currently the #1 in this division is Jose Aldo); he suffered his last defeat in 2010 when he faced Joseph Duffy, since then he has collected 12 consecutive victories (four in the Ufc) beating Dustin Poirier in his last bout (=Poirier vs McGregor). His opponent, the black belt in tae kwon do Dennis Siver, has an official record of 22-9-0 (64% finishing rate) and he entered as the No.19 in the same weight class, he lost to Cub Swanson in 2013 (=Swanson vs Siver) but then he came back to win defeating Manny Gamburyan (later the result was changed to “no-contest” because he tested positive for hCG) and Charles Rosa. 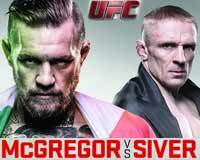 McGregor vs Siver is the main event of UFC Fight Night 59. Watch the video and rate this fight! Review: 2013-07-06, some good shots and a good finish: Cub Swanson vs Dennis Siver gets three stars (UFC Fight of the Night). Cub Swanson (19-5-0, 74% finishing rate) entered as the No.7 featherweight in the world while Dennis Siver (21-8-0, 67% finishing rate) entered as the No.6. Swanson vs Siver is on the undercard of Anderson Silva vs Chris Weidman – UFC 162. Watch the video! Review: 2012-04-14, pretty fight with some nice exchanges between Diego Nunes and Dennis Siver but it is not enough to get three stars. Diego Nunes (17-2-0) entered as the No.9 featherweight in the world while Dennis Siver (19-8-0) entered as the No.18. Nunes vs Siver is on the undercard of Gustafsson vs Silva (UFC on Fuel TV 2). Watch the video! Review: 2011-10-29, three stars for the nice fight between Dennis Siver and Donald Cerrone, preliminary card of the “UFC 137: Penn vs Diaz”. At the beginning of the first round Cerrone almost knocks Siver out with a nice head kick, instead the fight ends shortly after with the “Submission of the Night” (rear-naked choke) of Cerrone. Dennis Siver entered the fight with a record of 19-7-0 while Donald Cerrone had a record of 16-3-0. Watch the video! Review: 2011-07-02, pleasant fight between Matt Wiman and Dennis Siver (UFC 132 – Cruz vs Faber 2). Dennis Siver defeated Matt Wiman by unanimous decision but it was not a clear victory. Watch the video!